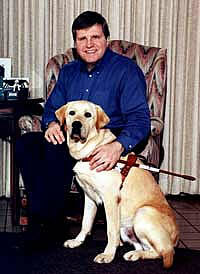 Nesbit was Delta Airlines' first guide dog to become a "Million Miler". At a special event held at the 2008 CSUN Conference, Delta personnel presented Nesbit with his own frequent flyer card and a plaque hallmarking his "million mile" accomplishment. Nesbit’s partner, George, is the Secretary General of the DAISY Consortium, and Nesbit was by his side as he journeyed to meetings and conferences around the world. His work involved a great deal of travel both national and international, and Nesbit guided him whenever it was possible for him to travel with George - if it was too far or difficult for Nesbit to travel too. Nesbit safely guided George through many cities around the world from his graduation from Feb 1999 to his retirement in Mar 2008. Nesbit spent his retirement years with George and his wife Lucy.